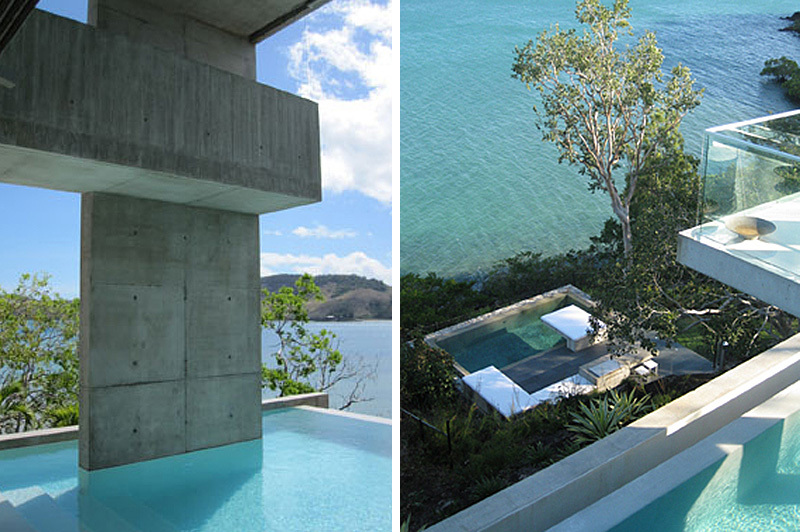 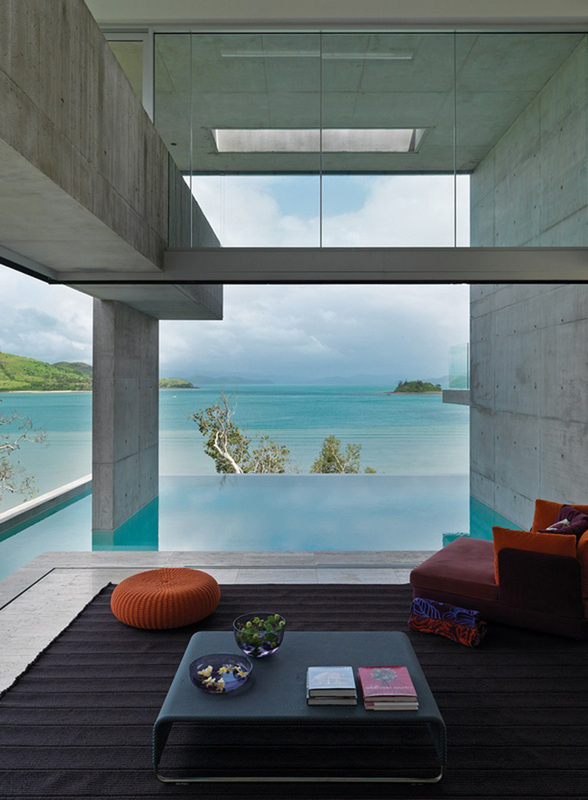 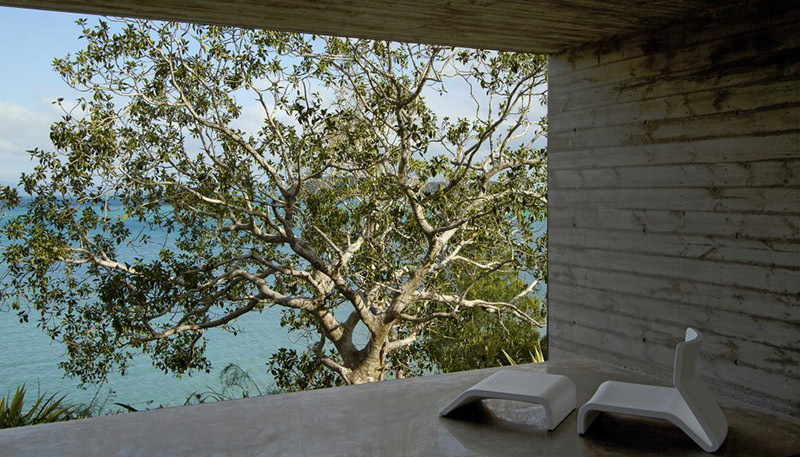 This Hamilton Island house, known as Solis, was designed by Renato D’Ettorre Architects. 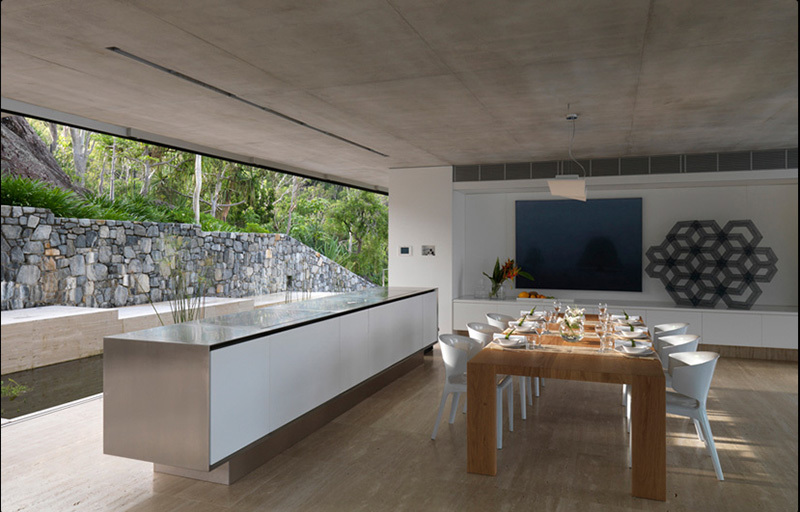 Solis was created from concrete imprinted with a timber grain and the floors are a cool limestone to suit tropical living. 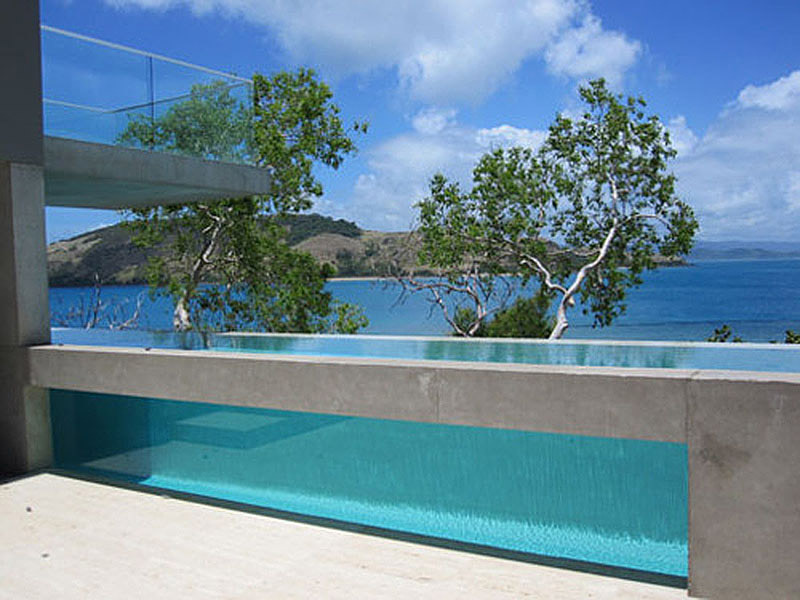 The pool stretches almost to the living area for a relaxed holiday feel. 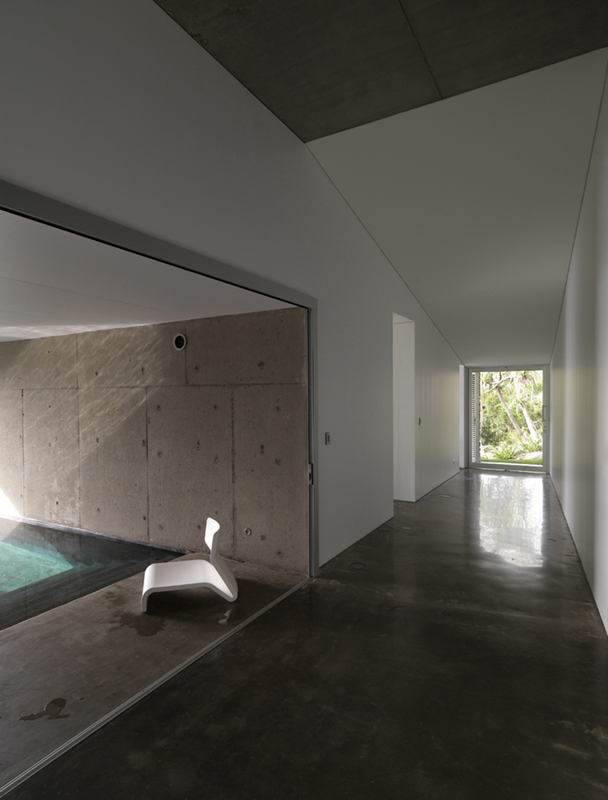 The residence is sculpted from concrete, stone, block work and glass resulting in a sequence of dramatic volumes incorporating airy living spaces and private sheltered outdoor zones. 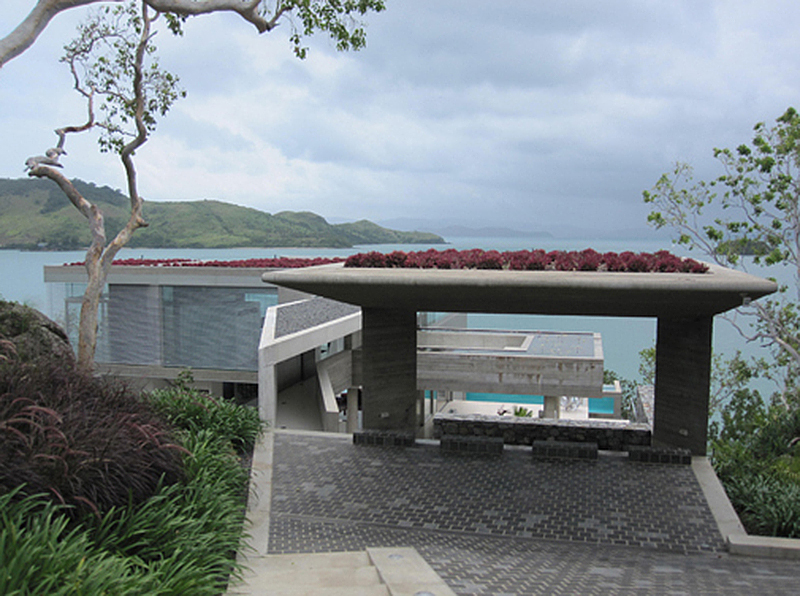 An open living and environmentally integrated home on Hamilton Island, it’s all about tropical living. 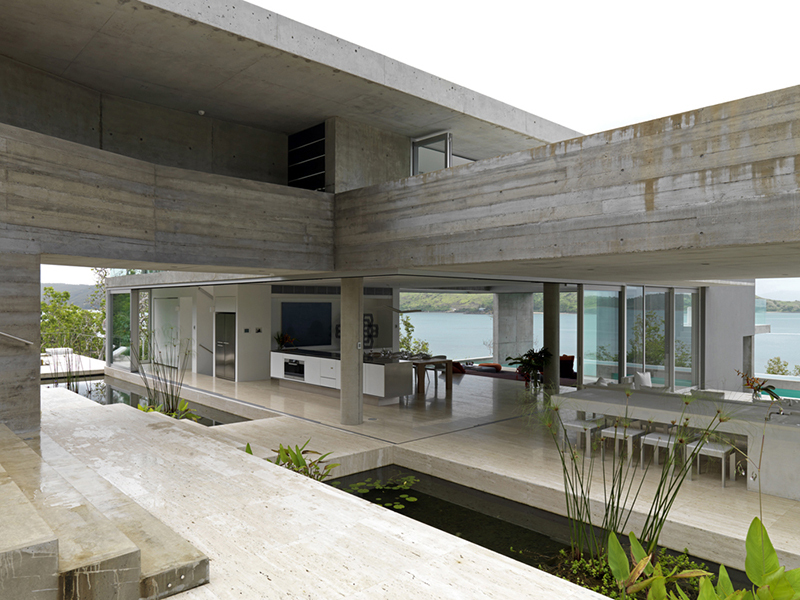 Terraces are fluid extensions of internal spaces capturing cooling breezes. 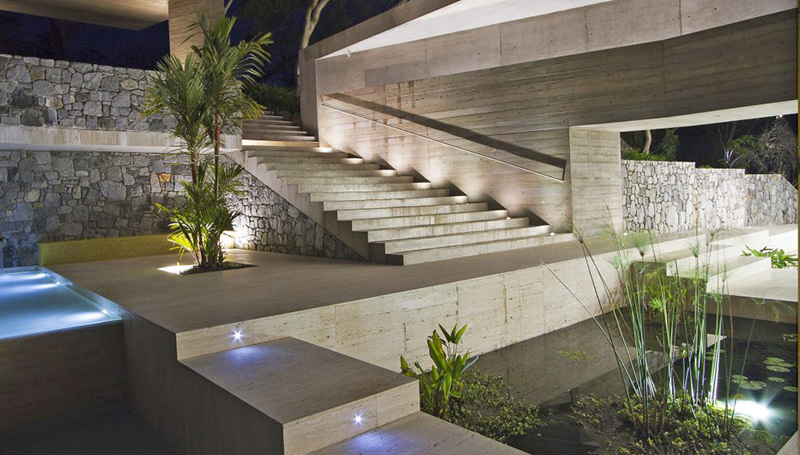 Swimming pools, reflection ponds and strategically positioned trickling waterfalls soothe both indoors and outdoors. 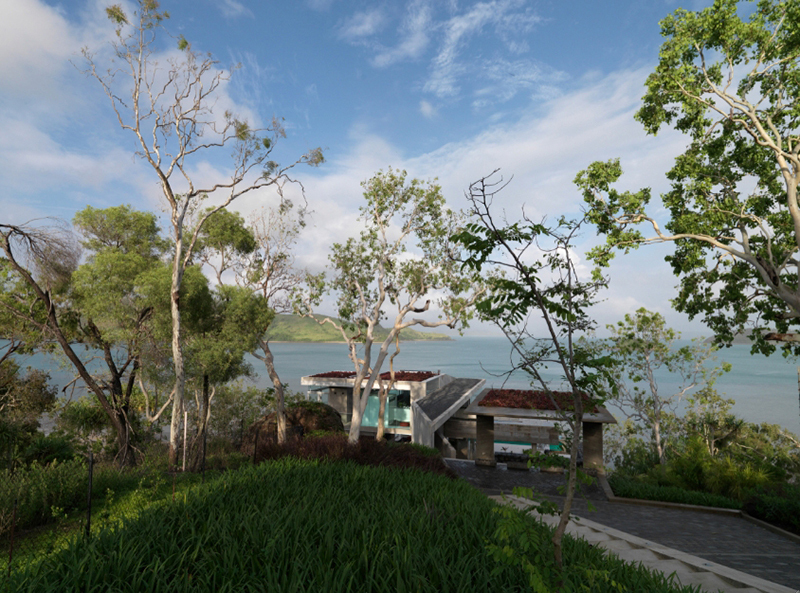 The house is also built to withstand the destructive forces of tropical cyclones. 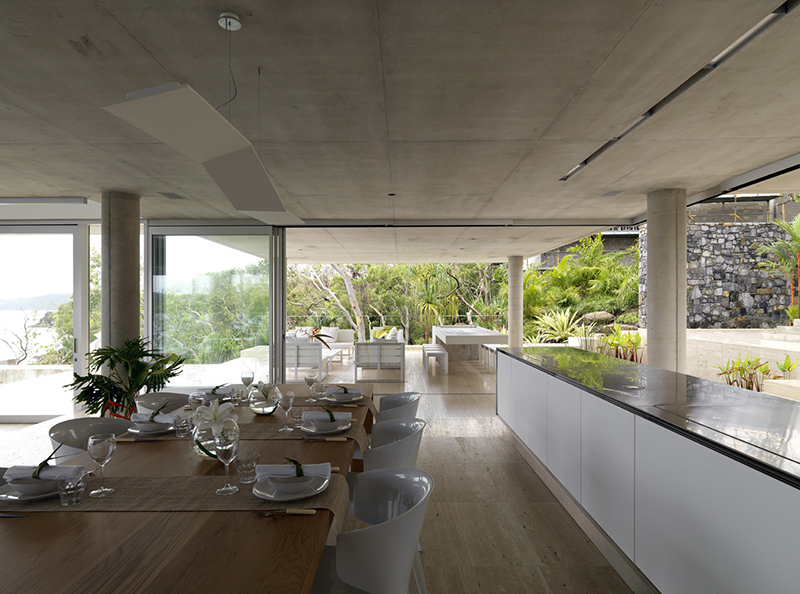 The client had asked for low maintenance materials – so concrete became the primary material. 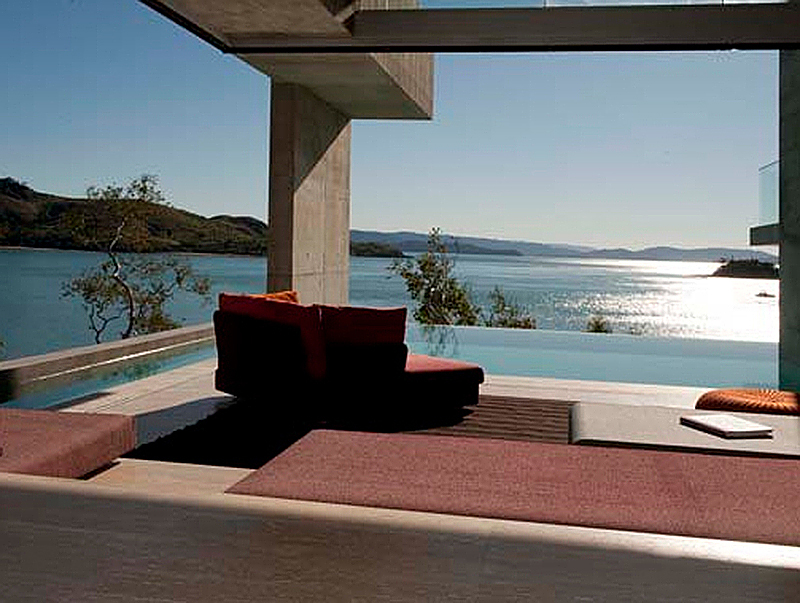 The ready-made finish eliminates the need for render or paint, as well as lending the project an instant patina. 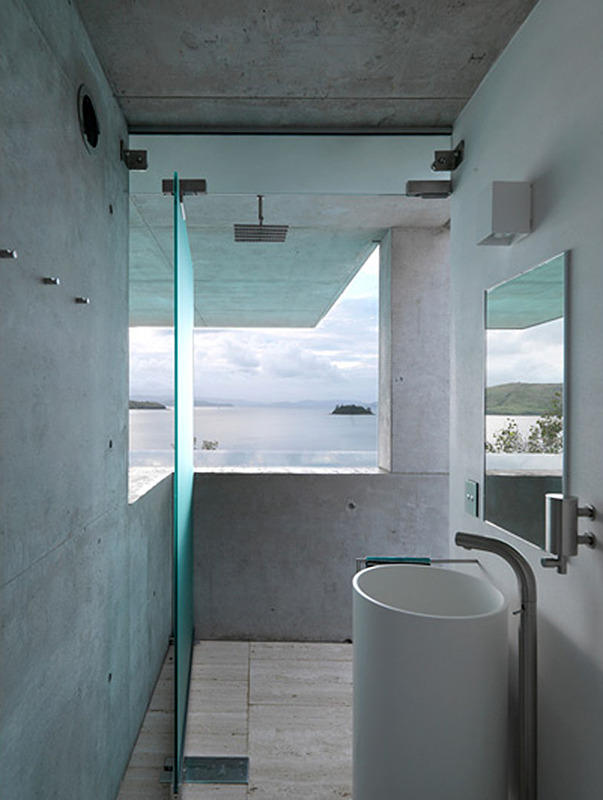 Finishes such as polished concrete, unfilled honed travertine tiles and textured internal renders were selected for their durability and tactile qualities; the irresistible urge is to experience the house bare-feet whilst enjoying the touch of the smooth, cool stone. 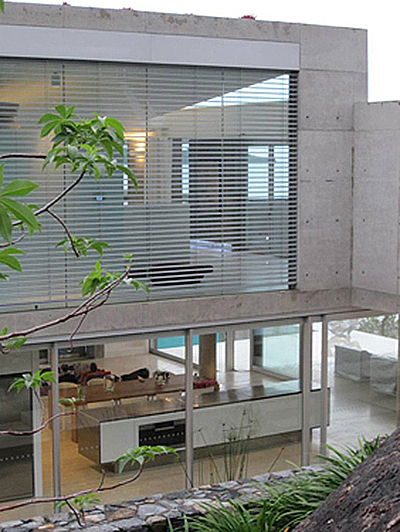 The house is approached through an unremarkable, albeit leafy, suburban precinct. 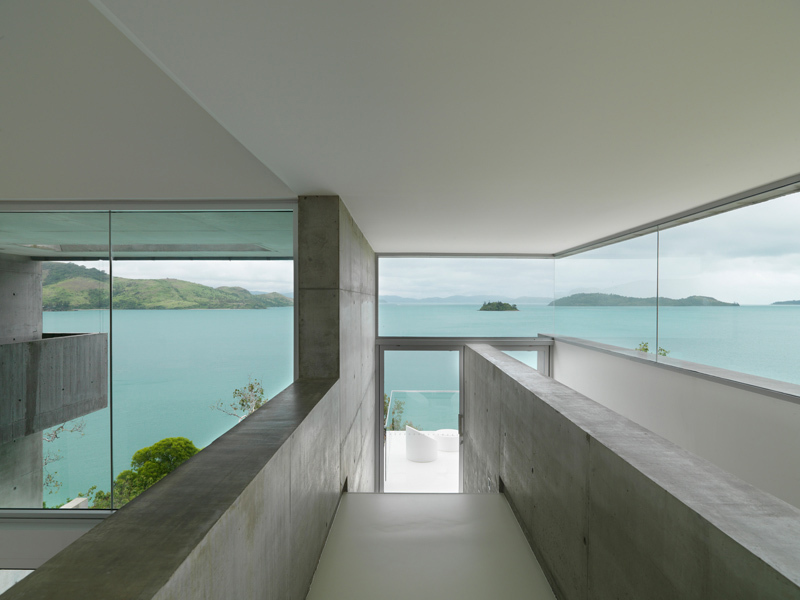 Down a steep driveway, the buggy garage frames the first views of the waters below and a hovering balcony reflection pond provides the first experience of the house. 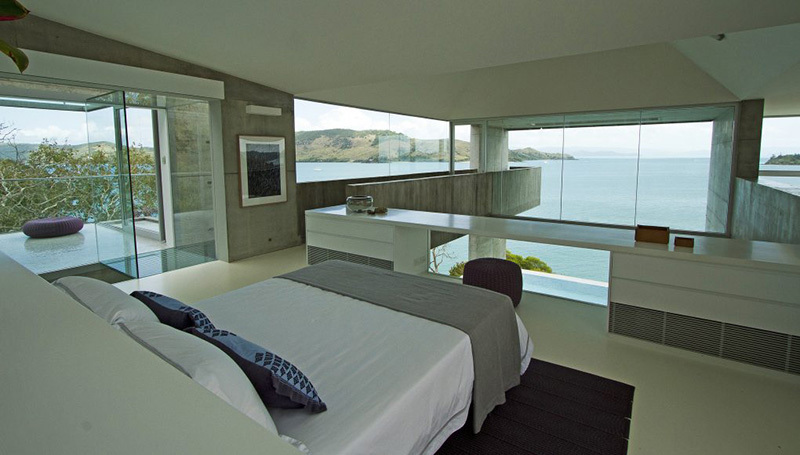 An open living platform cut into the hill is separated by another reflection pond, while hovering above the sea and further living spaces below. 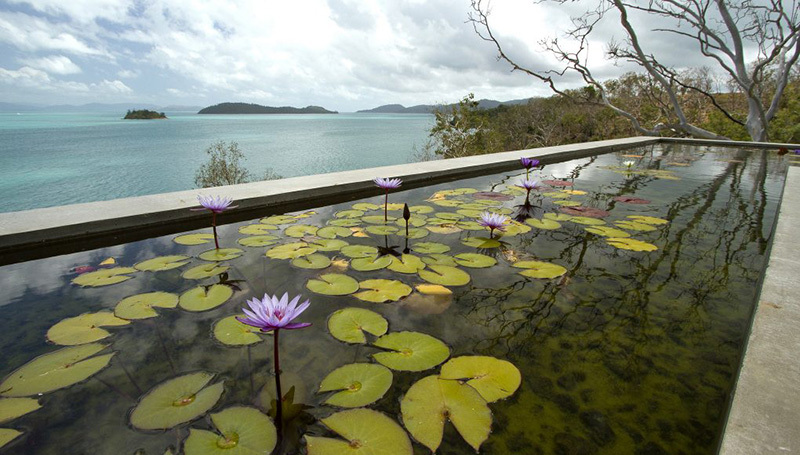 The experience as you navigate the various levels of the house is of seemingly endless water encounters: reflection ponds, lily ponds, swimming ponds and constructed views of the azure ocean. 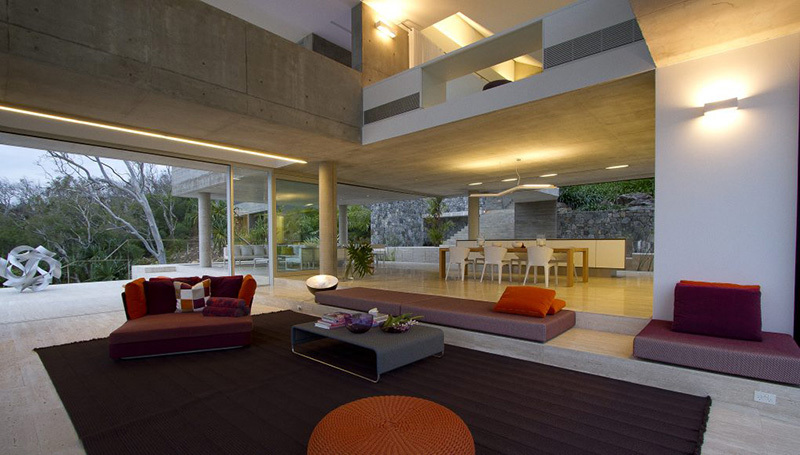 The house changes its mood on descent. 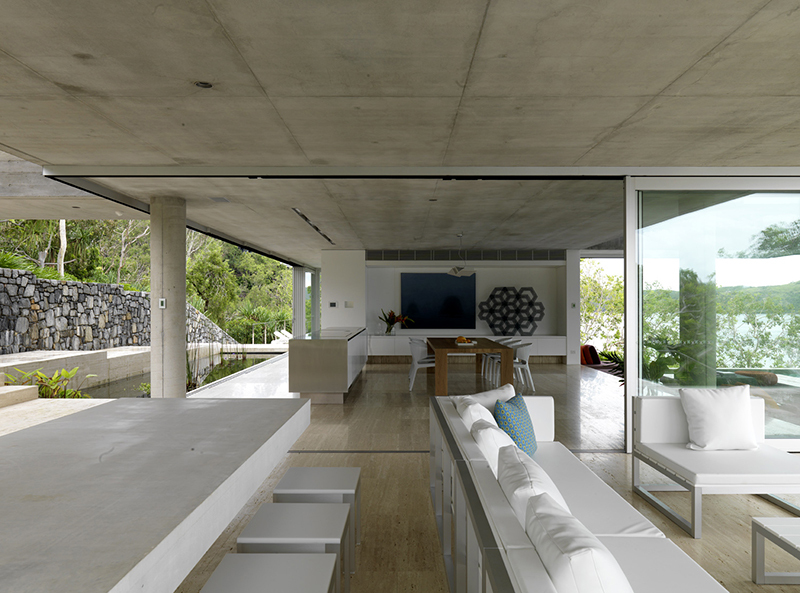 The upper living areas are light-filled and airy, with little distinction between indoor and outdoor space. 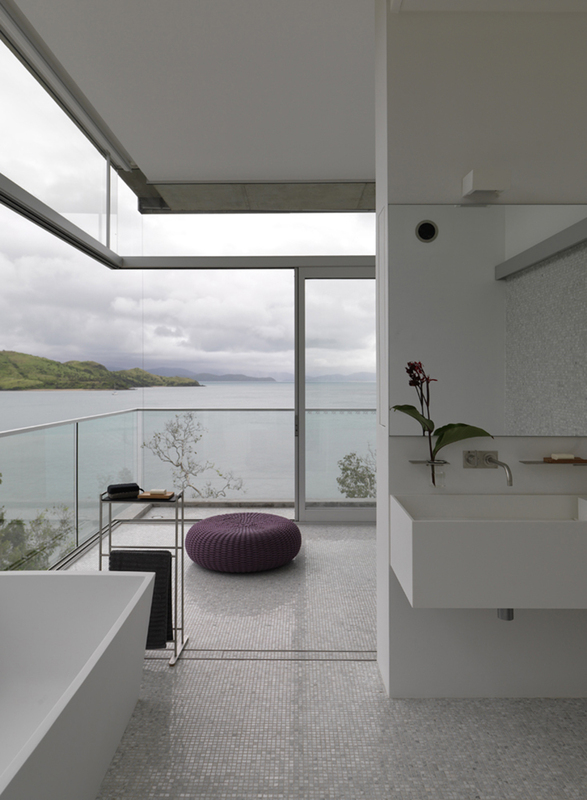 In fact, only a small section of this floor can be closed down by screens to provide security, particularly during tropical storms. 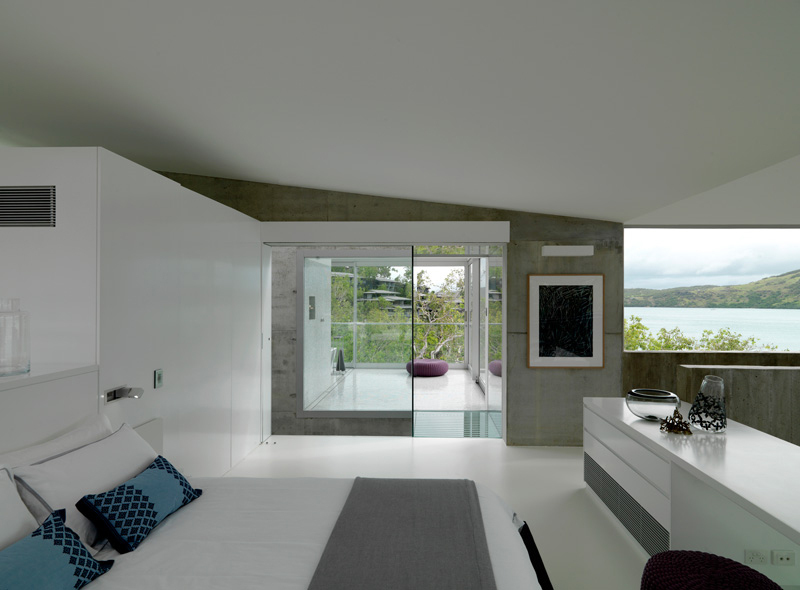 The lower reaches of the house are more cavernous – cool bedroom chambers, again formed on the ocean views. 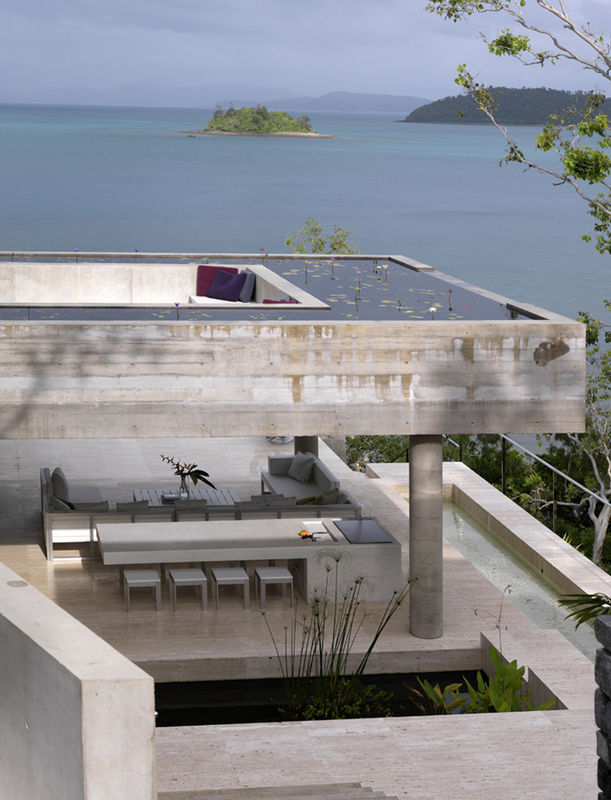 The palette is concrete and travertine, designed for easy, maintenance-free, cool living in the tropics, while acting as a calm counterpoint to complex spatial and sculptural interactions. 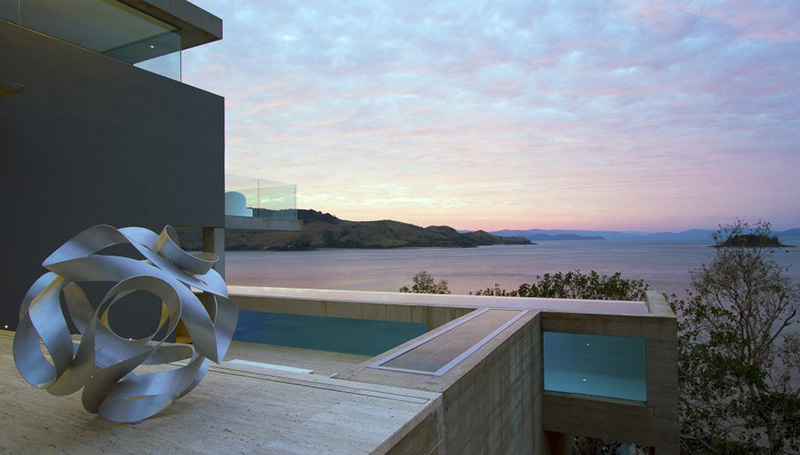 Every level of this house, every turn and every vantage point provides enormous surprise and delight. 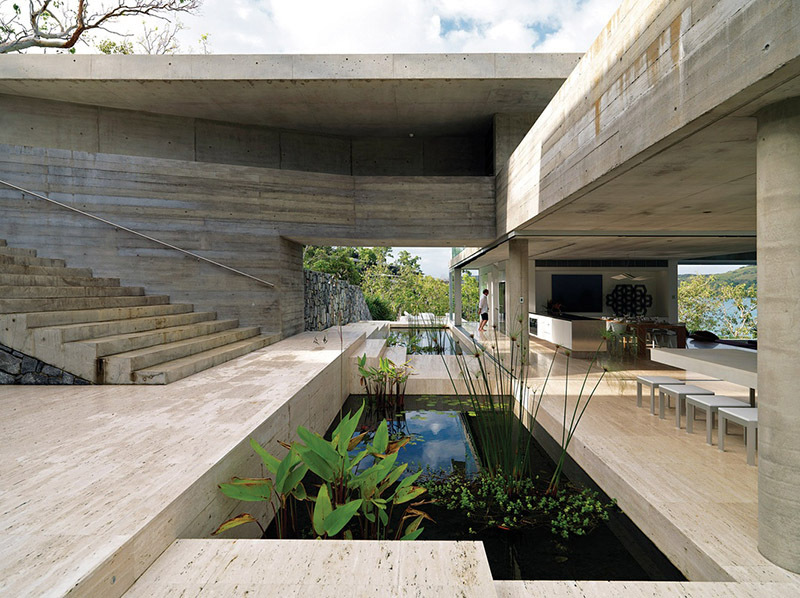 Corners of the house float above the terraced landscape, garden terraces and nooks set into the hillside, which feature natural stone retaining walls and continuing encounters with water pools and ponds. 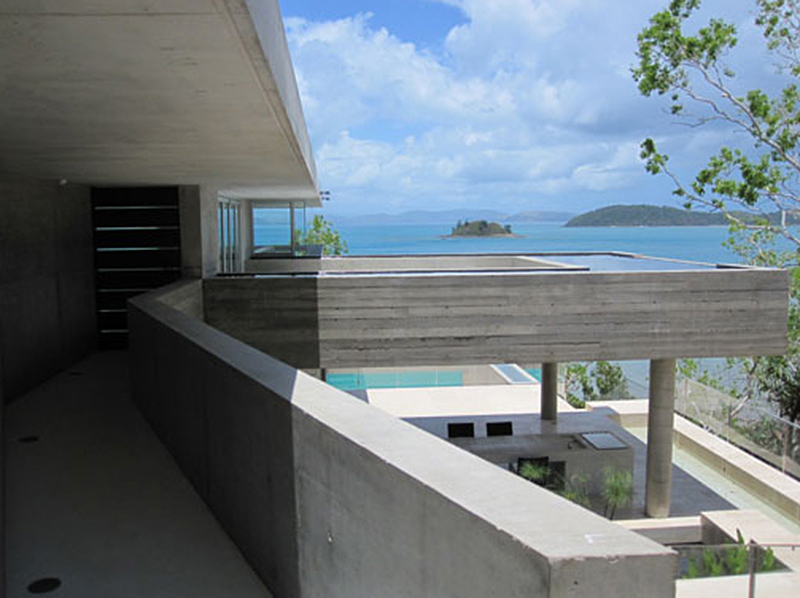 The house was the recipient of the House of the Year project at the Australian Institute of Architects’ 2011 Central Queensland Regional Architecture Awards. 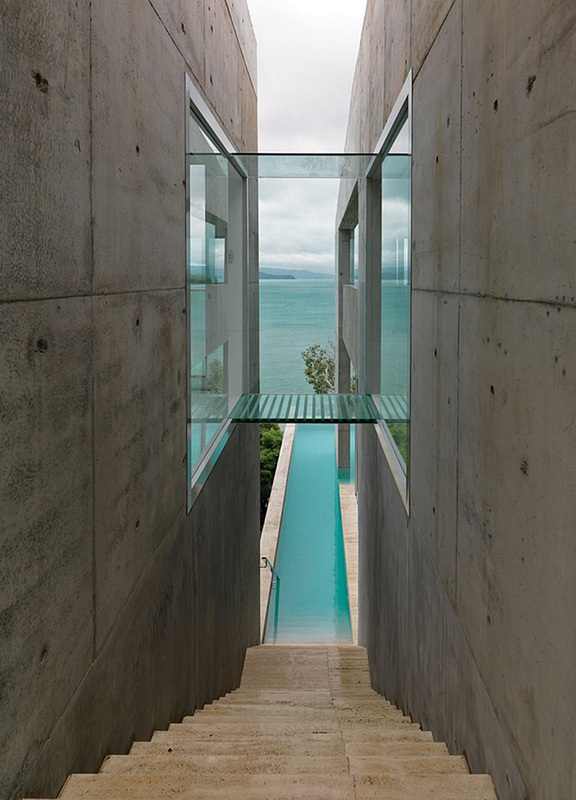 There are so many options with concrete these days. 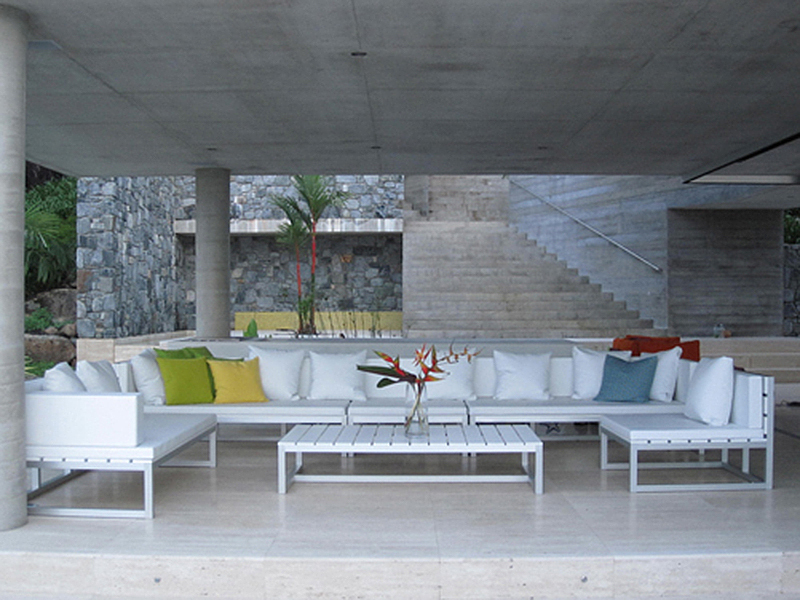 Concrete can be decorative, smart and fashionable.